1. Flying Lotus- You're Dead! Similar year-end listings were published at Plastic Sax in 2013, 2012, 2011 and 2010. Now's the time to go back in time. The lively 1930s recordings of Andy Kirk and His Twelve Clouds of Joy are eternally engaging. While much of the Kansas City band's discography may be purchased through dodgy European labels, a set of 11 tracks including "Dunkin' a Doughnut" is available as a free download at the Internet Archive. *Bobby Watson made an appearance on a local television program. *The Kansas City Star documented the deterioration of Highland Cemetery. Plastic Sax visited the cemetery in September. *Hermon Mehari posted a clip of a recent performance to SoundCloud. *The Pitch recommends Friday's offerings at the Green Lady Lounge. *From Chris Burnett: I am writing on behalf of Ms. Jayne McShann-Lewis, daughter of the late legendary pianist, Jay McShann. Jayne is producing a Gospel-Classical-Jazz musical on Friday, December 19th. She believes this musical to be the first of its kind produced in Kansas City. Gospel-Classical-Jazz music will be performed together at this event, demonstrating the two genres have an inherent unity of history and sound. The event will also feature a panel discussion on the topic... Boone Tabernacle Church of God in Christ, 1317 E. 12th Street, Kansas City, MO 64106, 7pm. $15. The first set of Bob Bowman's album release party at the Orion Room in the basement of the Green Lady Lounge attracted a capacity audience on Thursday, November 20. Dozens of longtime fans of the bassist and many of his fellow musicians filled the handsome room with a convivial atmosphere. Bowman was supported by guitarist Danny Embrey, pianist Roger Wilder and drummer Todd Strait. Vocalist Megan Birdsall joined the quartet for one selection. Bowman's artistic and physical rejuvenation is one of the happiest recent developments on Kansas City's jazz scene. 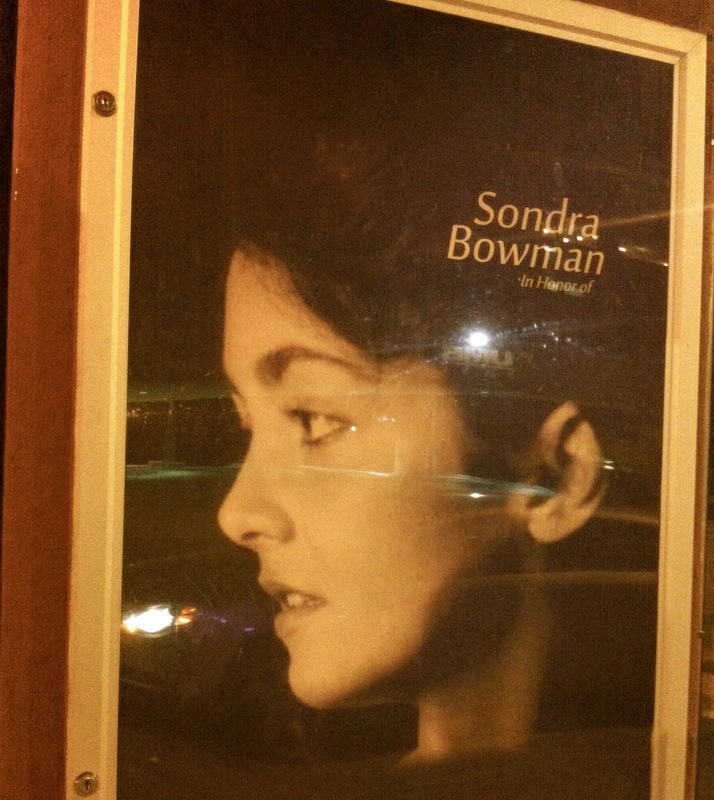 The official function for the release of the album Songs for Sandra, consequently, doubled as a celebration of Bowman's vitality. Jazz bohemian Elliott Levin will appear at Take Five Coffee + Bar on Saturday, November 22, and at the RecordBar on Sunday, November 23. A press release from the Johnson County venue suggests that "this will be some of the wildest, most intense music we’ve ever had at Take Five." *The Wyandotte Daily reports that the owners of the Broadway Jazz Club are considering opening a second location in Kansas City, Kansas. *A report on Bob Bowman's new album is the highlight of Joe Klopus' weekly column. *Big crowds at Take Five Coffee + Bar and the Broadway Jazz Club are celebrated by KC Jazz Lark. *The Pitch recommends Bobby Watson's gigs at the Broadway Jazz Club. *Hermon Mehari's portion of the 2014 Thelonious Monk International Jazz Trumpet Competition begins at the 3:02:15 portion of a five-hour video. *Chris Burnett posted tips he shares with his students. *Chuck Berg reviewed a Topeka Jazz Workshop concert featuring Chuck Redd and Nicki Parrott. *Joe Dimino interviewed Reggie Watkins for his Neon Jazz podcast. *Tweet o' the Week: Green Lady Lounge- GreenLadyLounge wishes a very happy b-day to Tim Whitmer - Kansas City's beloved Jazz Pianist, Entertainer & Friend. *From Take Five Coffee: It's our belief that presenting the full range of good jazz, from the most accessible to the most challenging, is the best way to honor the music's traditions and its possibilities. So when Jeff Harshbarger said Philly free jazz monster Elliott Levin would be in town and offered to bring him to Take Five, then added piano virtuoso Thollem McDonas to the mix, we made it the centerpiece of our weekend. Come see just how far out the music at Take Five Coffee + Bar can go… Saturday, November 22, 8pm… We suspect this will be some of the wildest, most intense music we’ve ever had at Take Five. Come with your ears wide open and prepare to be challenged. This is essentially Snuff Jazz — Jeff Harshbarger on bass, Mark Southerland on tenor sax and bags of tricks, and Brian Steever on drums — with two of the most powerful improvisational musicians walking the planet today. Elliott Levin, in from Philadelphia, plays tenor sax and flute and is a ferocious free jazz force. Pianist Thollem McDonas is simply traveling the world blowing up everyone’s idea of what can be done on a piano… $10 cover. *From the University of Kansas: The University of Kansas Jazz Ensemble I will perform with vocalist Deborah Brown at 7:00 p.m. on Monday, Dec. 1, 2014 in Helzberg Hall at the Kauffman Center for the Performing Arts. Admission to the event is free, but tickets are required. Please call 816-994-7222 for tickets. The performance is sponsored by Reach Out Kansas, Inc. The University of Kansas Jazz Ensemble I and director Dan Gailey proudly present an evening of big band jazz featuring world renowned jazz vocalist Deborah Brown. In addition to arrangements featuring Ms. Brown, the ensemble will present the world premiere of Gailey’s composition New Kansas City Suite, commissioned by Reach Out Kansas, Inc. The world premiere of New Kansas City Suite features: Clint Ashlock, trumpet; Matt Otto, tenor saxophone; Danny Embrey, guitar; Jeff Harshbarger, bass; and Brandon Draper, drums. The clarion call of an excellent trumpeter caught my ear as I wandered in downtown Kansas City a few years ago. I traced the sound to a sidewalk cafe where the duo of Clint Ashlock and Mark Lowrey were playing tasteful swing. I was reminded of the incident when I heard The Return, the fine new album by trumpeter Ashlock and pianist Ben Markley. As might be expected of a pair of respected young musicians who double as jazz educators, Ashlock and Markley play an impeccable version of modern bop. Eboni Fondren, one of Kansas City's finest jazz and pop vocalists, sang with the Salina Symphony in 2012. She brought down the house with a rendition of Etta James' "At Last." Fondren performs Friday, November 14, at Broadway Jazz Club and Sunday, November 16, at a jazz brunch at Chaz. *KC Jazz Lark lobbies for a large-scale jazz festival in Kansas City. *Chicago's Marquis Hill surpassed musicians including Kansas City's Hermon Mehari to win the 2014 Thelonious Monk International Trumpet Competition. The Kansas City Star sent a shout-out to Mehari. *An appearance by Karl McComas-Reichl Trio is highlighted by The Pitch. *A television station aired a brief report about the fundraising efforts of members of the Kansas City Kansas Community College's jazz band. They're attempting to finance a trip to Cuba. *Peter Hum interviewed Pat Metheny. *Tweet o' the Week: Chris Hazelton- Okay lovers of 45s, trying to game plan the next release. Do you want more instrumental soul-jazz, soul with vocals, or straight up funk? *Comment o' the Week: cB- The promoter cancelled the Beat Funktion concert due to poor advanced ticket sales. *From Take Five Coffee: A trip to Brazil and a trip back in time mark the weekend ahead at Take Five Coffee + Bar as we present a feast of rhythms from far and wide… Friday, November 14, 8pm: Sons of Brasil. $5 cover… Saturday, November 15, 8pm: Clint Ashlock presents a tribute to The Jazz Messengers… $5 cover. Sunday, November 16, 10am - 2pm: Sunday Jazz Brunch: The Peter Schlamb Quartet… No cover. Identities Are Changeable, the ambitious new release by Miguel Zenón, is the sort of album that elicits more admiration than affection. Laden with spoken word segments and complex big band arrangements, Identities Are Changeable is the musical equivalent of a coffee table book. An audience of about 50 heard a very different version of the new material at the Blue Room on Monday, November 3, the night before the album was officially released. Zenón- one of the most celebrated jazz artists of our time- was joined by the eloquent Venezuelan pianist Luis Perdomo, Austrian bassist Hans Glawischnig and American-born drummer Eric Doob. Pared down to their core essences, fresh compositions like "Through Culture and Tradition" were riveting. The daring solos of the saxophonist struck me as the contemporary extension of Charlie Parker's innovations. A companion insisted that Zenón was channeling Art Pepper. We agreed that we were hearing one of the best performances of 2014. Swedish acid jazz band Beat Funktion will perform at the Gem Theater on Saturday, November 15. The sextet's performance in the embedded video indicates that fans of the Headhunters and the Crusaders are in for a good time. *KC Jazz Lark documents the debut of the People's Liberation Big Band at Take Five Coffee + Bar's new location. *Anita Dixon made a television appearance to promote the centennial anniversary of the Mutual Musicians Foundation. *Jazz students representing UMKC's Conservatory of Music and Dance perform at the 3:50 mark on a televised news program. *"A Risk I Take" , another track from Chris Burnett's forthcoming album, is available at CDBaby. *The Pitch cosigns Rob Scheps' latest barnstorming tour of the Kansas City area. *Christ Community church hosts the Brookside Jazz Festival on Friday, November 7. *Joe Dimino interviewed Bob Mintzer for his Neon Jazz podcast. *From Fanny Dunfee: Jazz musician, composer, educator Donivan Bailey has been selected as a Master educator in the Alaadeen Jazz Master/Apprentice Program for 2014/2015. Bailey has chosen and begun work with his Apprentice Jarred Stangohr. The Master/Apprentice pair has established a learning agreement to guide their work together through the Apprenticeship Program with activities scheduled throughout the year, based on the Alaadeen Method Of Instruction™... The 2013 Program sponsored Donivan Bailey and Dennis Winslett as Masters. *From Johnson County Community College: Chris Botti, who won a Grammy in 2013 for best pop instrumental album, will perform at 7:30 p.m. Friday, Dec. 5, at Johnson County Community College… Tickets… are $120, $60 and $50… Botti is a multiple gold and platinum performer who has found a form of creative expression that begins in jazz and expands beyond the limits of any single genre. He has recorded and performed with artists who include Sting, Josh Groban, Yo-Yo Ma, Michael Bublé, Paul Smith, Joni Mitchell, John Mayer, Aerosmith’s Steven Tyler and Frank Sinatra. J.E. Chapman's name may not ring a bell with many attentive observers of Kansas City's jazz scene, but the credits of his album 364 Days read like a regional who's-who. The notable musicians contributing to the project include Clint Ashlock, Chris Burnett, Ryan Heinlein, Steve Lambert, the Leifer brothers, Hermon Mehari, Andrew Ouellette and Brian Steever. In the tradition of grand-scale compositions by Gil Evans and Bob Brookmeyer, 364 Days is an admirably ambitious and entirely fetching work. Chapman describes the big band suite as "21st century jazz compositions with reverence, respect, and homage to the past jazz composition masters." I consider it a worthy sequel to Bobby Watson's swinging The Gates BBQ Suite.